Guns banned at NRA convention. That seems odd. Note: the secret service will STILL have guns. 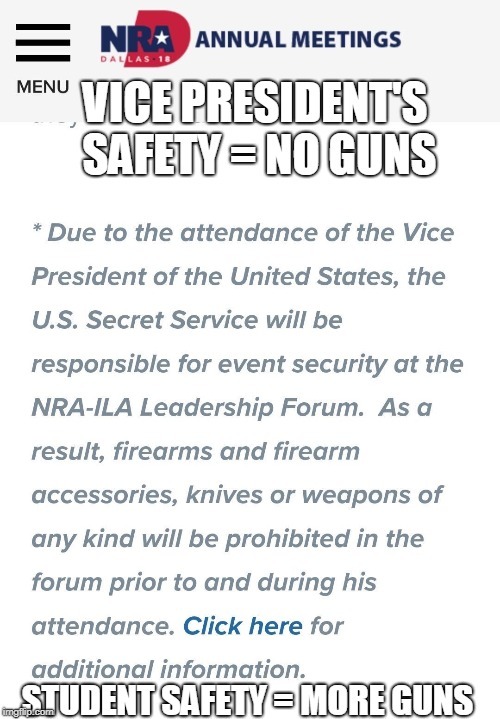 It is merely the attendees who will be disarmed. There will be more than a sign enforcing it too. People will be checked as they enter. So maybe we need better security measures like that at schools. No need for armed guards or teachers. You are forgetting that the secret service will have guns. There is still armed protection/enforcement. If you "catch" someone trying to bring a gun in, and there is NO armed enforcement, realistically m, who is goimg to stop them? But there are no bad guys in the NRA. They are all law abiding citizens. This is an infringement of their GOD GIVEN right to bear arms. They're just complying with the law. He'd still be safe in a crowd of however many NRA members - unless some idiot non-NRA wanted to false flag an attack to pin on the NRA - which would likely be a probability comfortably above 1.00 . Too many guns spoils the soup.